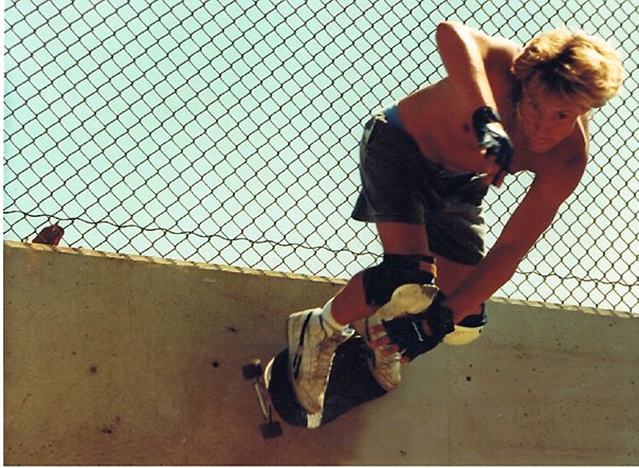 Since 1973, skateboarding has been one of the most important things in my life. The first skateboard I ever owned was a wooden Super Surfer when I was 5 years old. I earned that board by saving my weekly 25cent allowance for nearly a year. I was brought up as an only child in the mostly Mexican-American populated city of Maywood which is located in the southeast Los Angeles area. 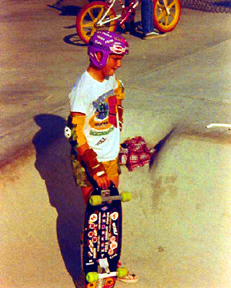 I skated as the youngest member in a group consisting of older local skate rats Johnny Rodriquez, Randy Sauceman, John Davis, Stevie Paulson, Dana Alan, the Maywood/Bell punks, and a few others. I remember when the pig-styled, wide boards first came out and everyone that I skated with had one but me. The most popular models in our area at that time were the Ray "Bones" Rodriquez snubnose, Hobie Starship, Sims Brad Bowman, and any of the Dogtown models. I also remember drooling over my buddy Mike Roots' brand new 12" wide Dogtown Bigfoot model in 5th grade-not knowing that very deck would have such a huge impact on me down the road. I promised my parents that I'd get straight A's and do all of the household chores forever if they got me a wide board. To my dismay, skate activities were temporarily stymied when they got divorced in the summer of 1978. While my parents worked out the details of their seperation and divorce, I was forced to live with my grandparents in affluent Palos Verdes Estates located south of Los Angeles. There I was, the new kid on the hill sporting an old 7" Hobie Skatepark Rider with Tracker mid-tracks and green Sims Snakes, while all the other neighborhood skaters had 10" Kanoa Pigs with Indy 131's and Kanoa Rollouts. I was really embarrassed by the appearance of my old, narrow, outdated deck and setup. I got heckled pretty hard by local skaters Billy Bingham, John Folk, Bill Burke and 1/4 pipe owner Matt Brady. It was during this time that I started getting heavily into surfing and noticed that wider surfboards worked better for me in small surf. I also noticed that when I rode my friends' wide pig-style skateboards, they seemed to work better for me on vert much like the wider surfboard. At that point, I knew I had to get on a pig deck badly-and at any cost. It didn't take long before I traded that old Hobie and some cash for a used 10" Dogtown board. 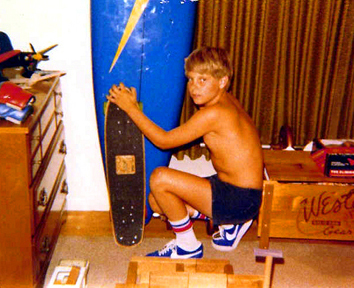 Shortly after that, I began trading and selling my belongings to get other wide boards, but it wasn't until Christmas 1980 that I finally got my first brand new wide board. After begging my Dad for a new Santa Cruz Steve Alba Bevel model with Indy 169's and red Blackhart wheels, I ended up getting an 11" Sims Andrecht model with Indy 169's and Bones Cubics II's instead. I guess our local Western Auto skateshop had sold the yellow Bevel that I wanted so badly, but the Sims deck and setup turned out to be more than adequate for me. From then on, I knew that I was a wide board addict for life. During the next few years, I had the privilege of skating several of the Southern California skateparks like Paramount, Lakewood, Skatopia, Big O, Whittier, Marina, Del Mar, and Upland. But it wasn't until the summer of 1980, when my father remarried and relocated us just south of Los Angeles to Long Beach, that I started taking skating and surfing very seriously. In the early 80's, I used to get up and ride my bike to Seal Beach and go surfing everyday at 5:00 am. In the summers, I would surf all morning, come home to eat a few bowls of Lucky Charms, and then skate up to the bus stop where I would take the RTD bus # 11 a few miles inland to Lakewood Skateworld. Lakewood was a great park and had a variety of skate terrains to choose from. It had a sick, tight, downhill-pitched halfpipe from hell, two front keyholes with tiles and coping, a killer banked slalom run,a snake run and the gnarly deep-ended Monster Bowl. It also had a lot of local rippers and was frequented by many of the top pros and amateurs of the day. I skated there with young locals Yanick Masse, Eddie Reatiqui, "Big" Tony Alvarez, Chris May, Rob and Jeff Heath, and hot park TEAM shredders Billy Wahl and Tim Metz. I also met some of my first Long Beach skate bros at that park. I met Raymond Duplese, Eddie Black, Roger Topp, Scott Goforth, Mike Jennings, Matt Rissica and Randy Freeman for skate sessions at Lakewood a lot in those days. There was one skater who stood out among the rest at Lakewood named Tim Metz. 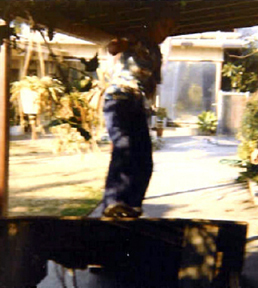 Tim had a flowing style mixed with lip-tricks, bio airs, and several handplant variations all at the ripe-old age of 13. He was a gifted skater and we all thought he was rad because he pulled off gnarlier moves with more style than some of the hottest pros of the time. 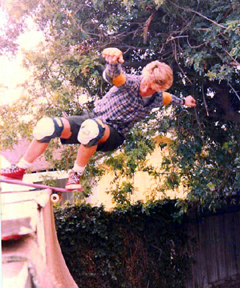 Tim Metz was one of the first skater-types that I met when I started at Wilson High School in 1982. He was always ahead of his time sporting Chuck Taylor's, Independent t-shirts, and Dickies pants everyday at school. Tim was the first of our crew to drive, so he took us to a lot of the parks, pools, and skate spots that still remained in our local area. We built a bunch of halfpipe ramps like Tom Garner's and Roland's-which were some of the best ramps LB ever had. We skated the ditch off the 5 freeway in Norwalk, "Rock Bottom", the "Casting Pond", and the "Wedge" in Belmont Shores, CSULB campus and the gnarly "Scumpit" near Tim's home in Long Beach, the "Kittie Banks" and "Rodriquez Banks" in Cerritos, the "Riverbed" in Hawaiian Gardens, the "Wall" and the "Bank" on Del Amo in Lakewood, the Signal Hill banks, the "Euclid V" in Fullerton, "Sadlands" in Anaheim, "Flower St.", and "Lloyd's Bank" in Santa Ana. Tim and I became close skate-buds, band mates, and lifelong friends because of our mutual appreciation for skateboarding and music. He was the first in our local area to get sponsored by a major company. I remember flipping out over the killer black Salba Bevel that Santa Cruz Skateboards had sent him. I was envious and sure wished I could have gotten one. That was the board I wanted so badly just a couple of years earlier, but was never able to get my hands on. I was completely blown away by the concave on this deck and just had to get one for myself. I tried and tried to search-out a black Santa Cruz Bevel, but I was just never able to pull it off. The same went for the Dogtown 12" that I really wanted and never got-these two boards were just not in the cards for me. I rode many different boards throughout the 80's and early 90's. But, it was the 12" Bigfoot and the Bevel that left me scarred for life. Somehow I had to get my hands on one or both of those decks-and E Bay wasn't big yet. I often thought to myself; "If only I could make a 12" board with huge concave, I'd be so stoked". 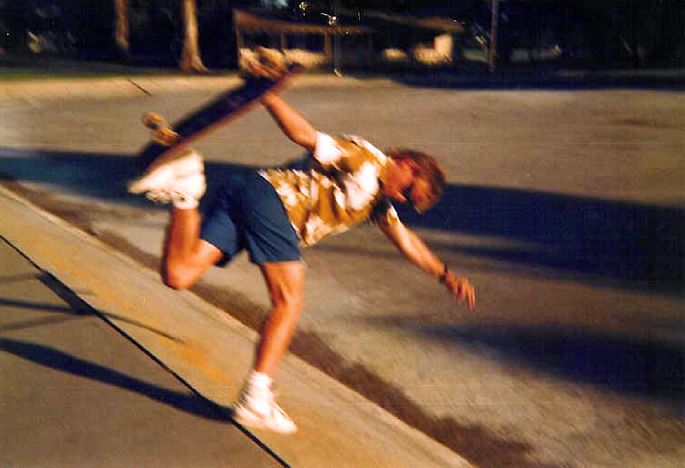 In 1995, after years of being turned off by new school decks, I decided to start my own skate company that would specialize in making wide boards. The feature product of my company (which I can't name for legal reasons) would be my personal favorite combination of designs which was basically a 12" wide pig with a massive concave all rolled into one killer "dreamboard". The board would be based on my two favorite decks of all time; the late 70's Dogtown Wes Humpston Bigfoot and the early eighties Salba Bevel by Santa Cruz. With the help and positive influence of my good friend and surfing/skating partner Herb Spitzer, we came up with the original template and outline of the board. Herb was largely responsible for rekindling my wide board addiction. During the 80's and 90's Herb made his own wide decks called "The Ditch Witch" and "The Beast" which were very similar to my own "dreamboard" ideas. 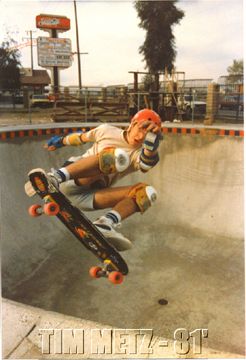 During an era of double-ended flip boards, Herb and another of my skate-friends named Ed Isaacs were probably the only wide board makers in the United States-if not the entire world...all I did was skate pools and ditches on the big 12"er-which at that time, was the only one in existence. 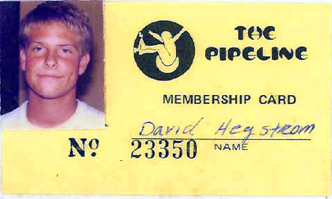 In 1996, a surfing buddy (whom I can't name for legal reasons) and I decided that he would be the sole financial backer for the new skate company. To make a long and ugly story short, my non-skater of a business partner raked me over the coals in the venture by completely backing out when the product was nearly ready for market. He seized the company inventory consisting of more than 500 decks, 200 sets of Independent 215mm trucks, and several boxes containing NOS (new-old stock) wheels, rails, tape, hardware, and accessories. He also broke all communications with me and has been sitting on the stuff still to this very day. Basically, my "dreamboard" had been squashed into oblivion. From 1996 to 2001, I rode my 12" pig "dreamboard" prototype into the ground. I just didn't enjoy riding anything else. It nearly killed me when I'd go skating and people would freak out trying to buy my deck right on the spot. They would always ask: "Dude, where did you get such a fat board?" And, "That's the fattest deck I've ever seen-where do I get one?" It was absolutely horrifying for me to have to answer their questions, but I did my best. On October 15th, 2001, with a pregnant wife at home, I learned that my ex-partner was suing me for $50,000. To make a longer and even uglier story short; I somehow got around it and prevailed in the end. I endured almost a year of legal trials and tribulations just because of my devotion to wide skateboards. However, I did learn a couple of things from all of it: "Don't ever go into business with friends", and "Don't let anyone or anything get in the way of your dreams". Although, the legal case nearly drove me to insanity, some good things came out of it after all. I decided to do my own skate company called Skaterbuilt Skateboard Co. and life has never been better for me. Well, it's been nearly 10 years since I wrote the above history piece, and Skaterbuilt has seen both the good and the bad sides of the skateboard industry. We will be working on an updated version of this write-up to include all that Skaterbuilt Skateboard Co. has endured during the past decade in order to still offer the highest quality skateboard products money can buy.